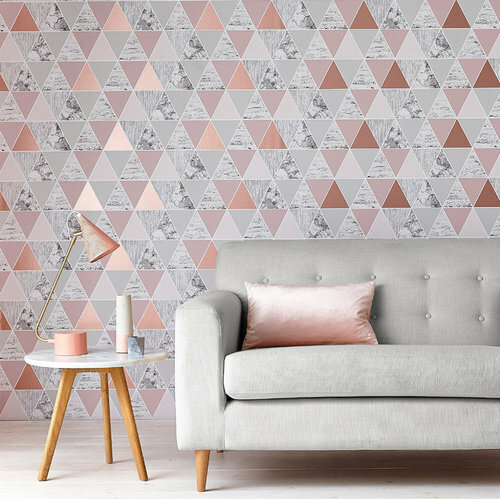 Statement wallpaper – have you braved it? 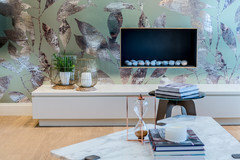 Dramatic wallpaper designs like these statement beauties can transform a room – and that's whether you choose to paper a feature wall or all four walls! Are you brave enough? 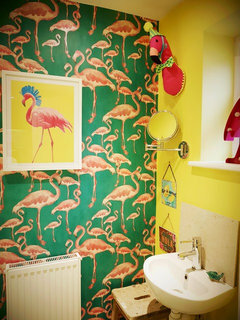 Tell us where you've dared to go bold with wallpaper at home (we'd love to see a photo too)! 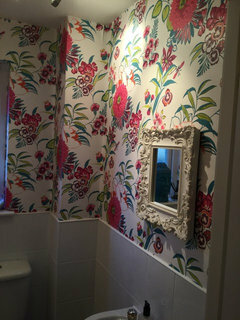 This is our downstairs loo. Why not express yourself a little? 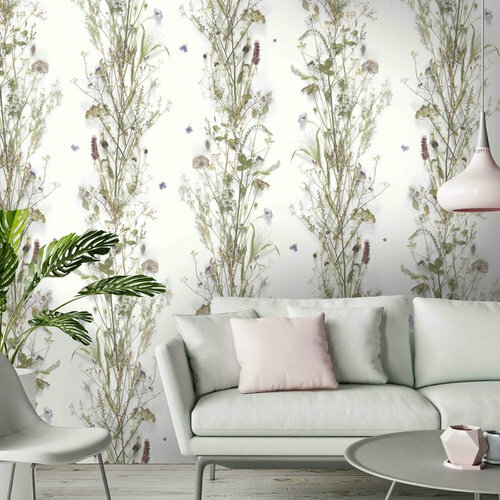 There are some amazing designs out there and it can create atmosphere in a room where you might not want to use a lot of art (bathrooms, spare bedrooms etc). 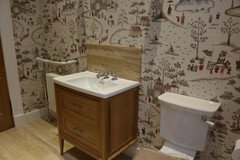 I’d like to find a home for some witty Fornasetti wallpaper some day. 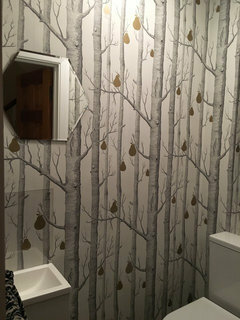 I love this wallpaper in my kitchen! 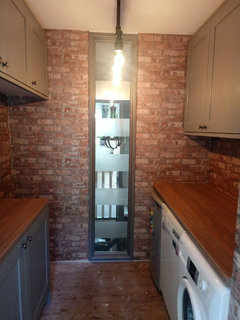 it softens the feel of the exposed brick behind my cooker which I wanted to leave to show off the original building. it was a coal room. 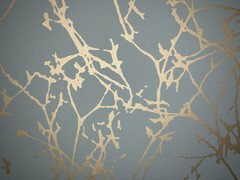 I have been looking for something different wallpaper wise for my house for when I get to the decorating stage. 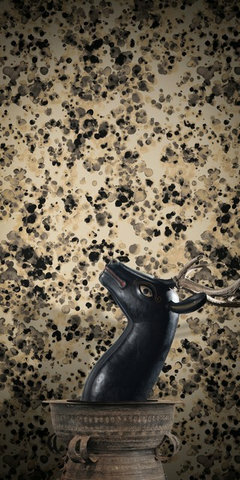 This morning I had a look on Aliexpress to see if they had any wallpapers, under Textile wallcoverings there is an amazing range of custom made to measure feature wall offerings, some are murals and for me a bit on the tacky side but some of the designs are definitelyin the 'making a statement' category. You need to read through the blarb a couple of times as some of the instructions have been done via Google translate but I am going to try one of the smaller designs for a bedroom and see how the order comes out. 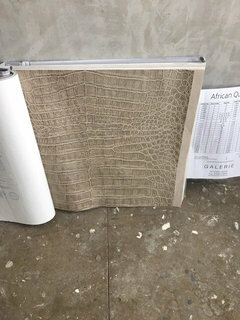 They print any given design to the size you want so that you can cover any wall. I have no idea how it will turn out but I like a lot of the designs, if the quality turns out to be good I will be delighted. If anyone has experience with ordering this kind of thing from Aliexpress I would love to know about it. 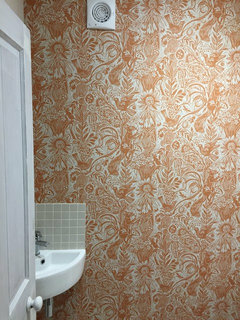 I like that paper , it reminds me of one of the lighter fruity William Morris designs. 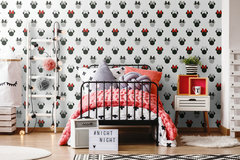 I am thinking of this; https://ae01.alicdn.com/kf/HTB1kpRic6ihSKJjy0Flq6ydEXXaw.jpg for my lounge, it's printed to fit the wall and works out around €300 for the wall so not exactly cheap but my wife likes it too and it compliments the three piece suite colours. unfortunately your link doesn't work for me. You got a different link? 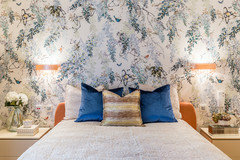 Love bold wallpaper as well as a good, bold paint. 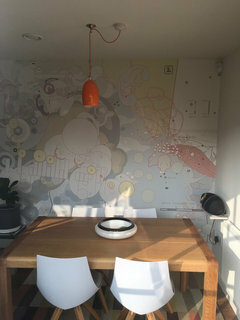 Have this one (piccie 1&2) on our landing - there are no windows so I wanted something fun but light. 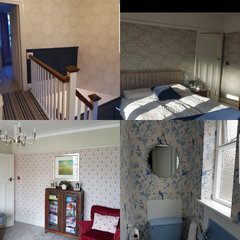 The second one is our lounge/diner...loved it for years but I’m the sort of person that loves to redecorate, so I feel that a change may be coming to this room soon...I daren’t tell the OH! l love wallpaper. 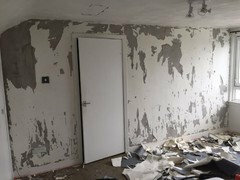 Just have the decorator in now. I tend to choose quite subtle, art deco styles in the main. 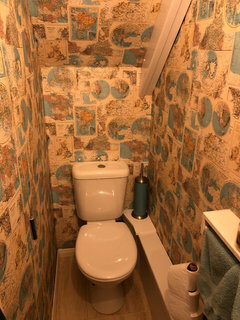 But have chosen a rich blue for the lounge, and a wild tropical look for the downstairs loo. What I I enjoy is variety in other people's homes. The point is it's fun. And it can be changed. If you are a fan of safe, plain white, go for it. But some of us like a bit more character. 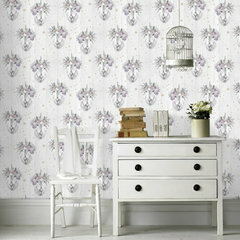 I really like wallpaper, but restricted to one wall. 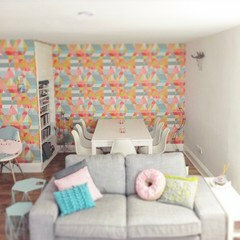 Ali and Helen...wallpaper envy! love a Flamingo and a Palm. 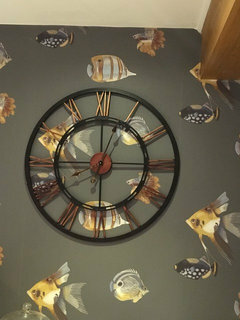 I have fish in my kitchen diner and trees in my downstairs cloak! 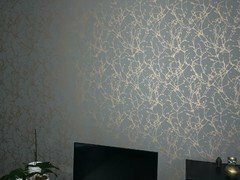 We did a feature wall with wallpaper in our main bedroom....its subtle yet striking and we are VERY pleased with it! 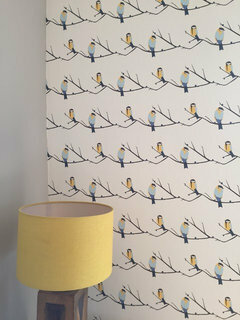 I love my Juneberry & Bird by Lorna Susan. 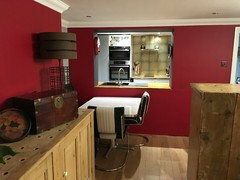 Finished decorating kitchen/diner just in time for Christmas. Sorry, Lorna Syson - predictive text! Renovating a mid century house, we slapped white paint almost everywhere except in the newly opened up hall way . 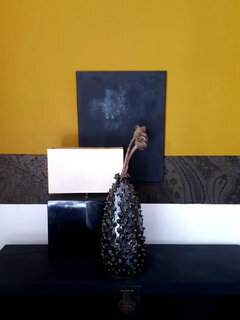 We chose a Josef Albers design to chime age wise and hung one colourway in the hall and another in the entrance.. 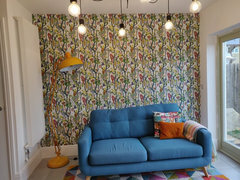 It is dramatic but cheerful and works well in transition areas I think. 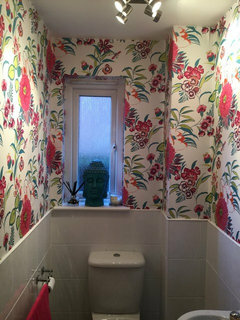 My downstairs loo. It’s been like this for at least 8 years and I still love it. I do fancy a change though. Wallpaper sometimes just works. 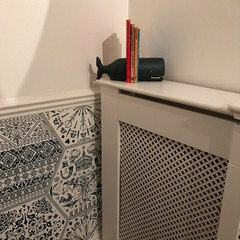 Here's my mini moderns in my 1960's house. I'd love to try a wallpaper but have never done it before. I change my mind a lot. 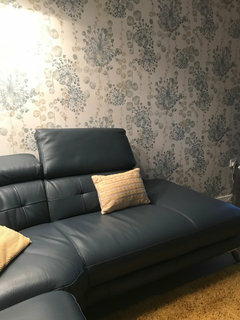 If I put it up and then want to change it, will I end up with a scrappy uneven looking wall after I've steamed it off? What are other people's experience? No sarah it wont ruin your wall if ti was in good condition before, should you decide to take it off again....unless its woodchip! 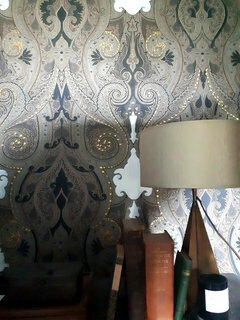 I love wallpaper. 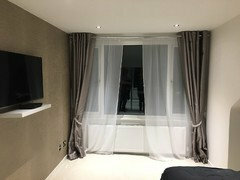 Every room has it in, as you can see! 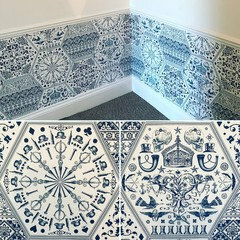 Looking for some wallpaper inspo? 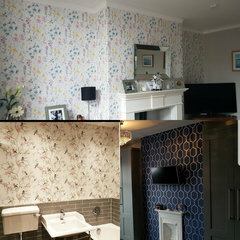 Check out our website: https://www.worldofwallpaper.com/ We've got a design for everyone and everyroom! 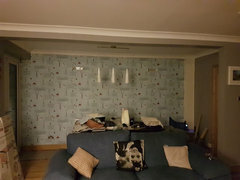 Ive got paint everywhere apart from fireplace. I really want to be adventurous. Now that ive seen others, im going to give it a go! 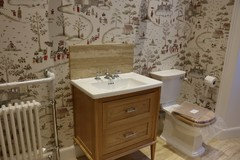 I thought this was quite bold, but creates a lovely cosy snug! A Mark Hearld paper from St Jude’s, in our downstairs loo. We love the design because we live in a Red Squirrel area! 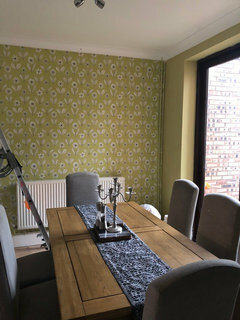 Decided to go a bit crazy with the dining room wall. Not too outrageous, just enough to stand out. 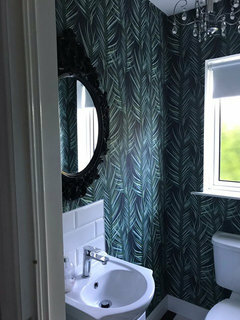 help with choosing wallpaper for my tiny vestibulle please. Help making a fireplace a statement! 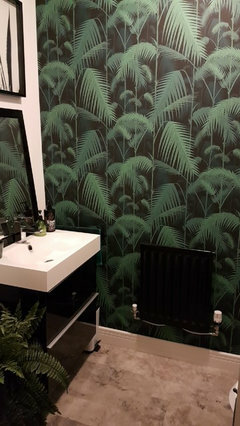 How bold do you go with wallpaper?